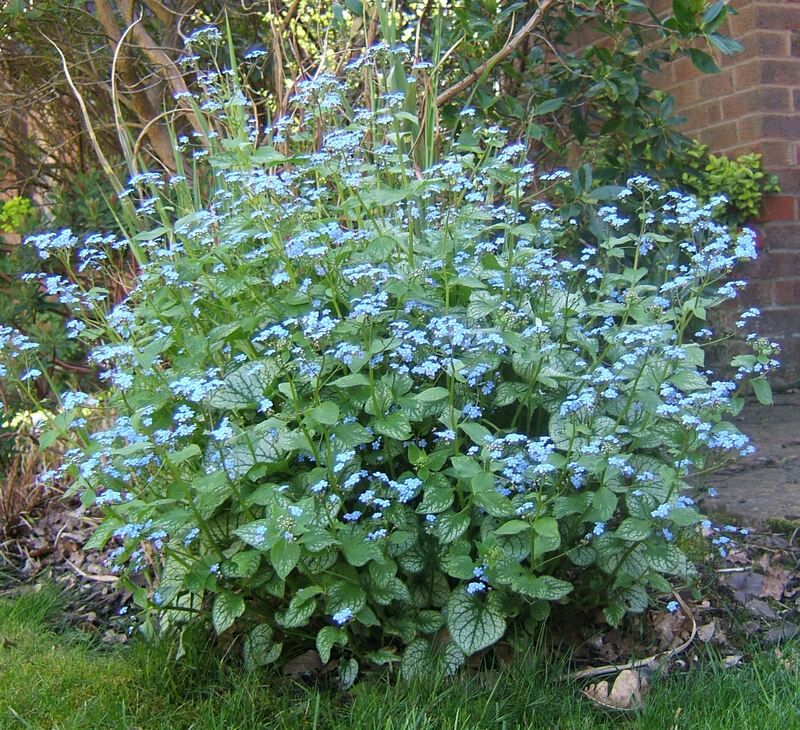 One plant that is looking really good at the moment is Brunnera ‘Jack Frost’. Those delicate “forget me not” blue flowers are a joy, particularly against the older leaves which have the typical silvered leaves that gives the variety its name. The younger leaves take a while to develop the hue, but are just as good a foil for the flowers. This particular plant is in the front garden, so the dogs don’t get too close to it. The brunneras in the back garden are not as robust as this plant, but they do get a lot more sun. I have the feeling that it is the growing conditions in the front that enable the plant to grow so well, rather than the impact of the dogs. For some time now I have felt that Spring was early this year – I suppose it makes sense as we had our snow two months earlier than we would normally expect, and there was much more of it this year, so the plants really believe that they have had a winter. I now have my confirmation that Spring is earlier this time around. 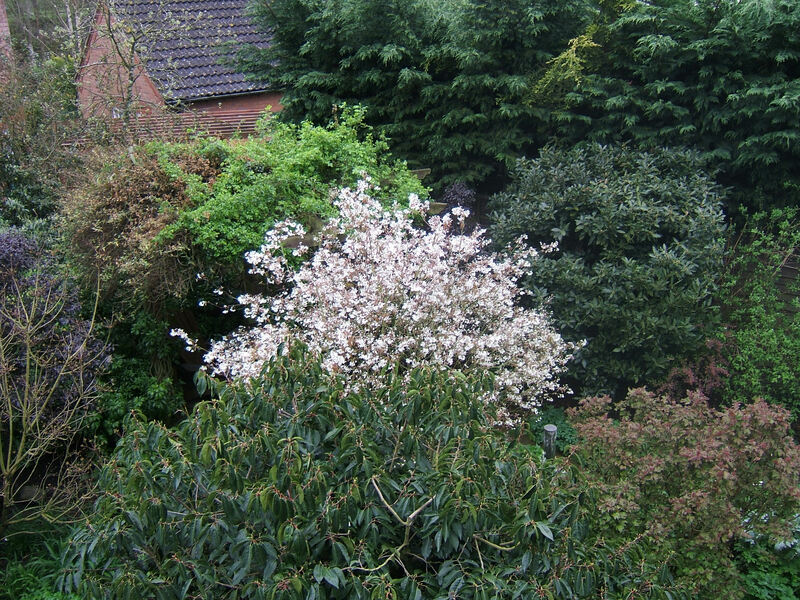 Last year the Amelanchier (Snowy Mespilus) was in flower in May – over a month later than in 2011. It only flowers very fleetingly – within a week, those beautiful snowy white flowers drop to the ground to allow the wonderful bronzy leaves to take over the show. 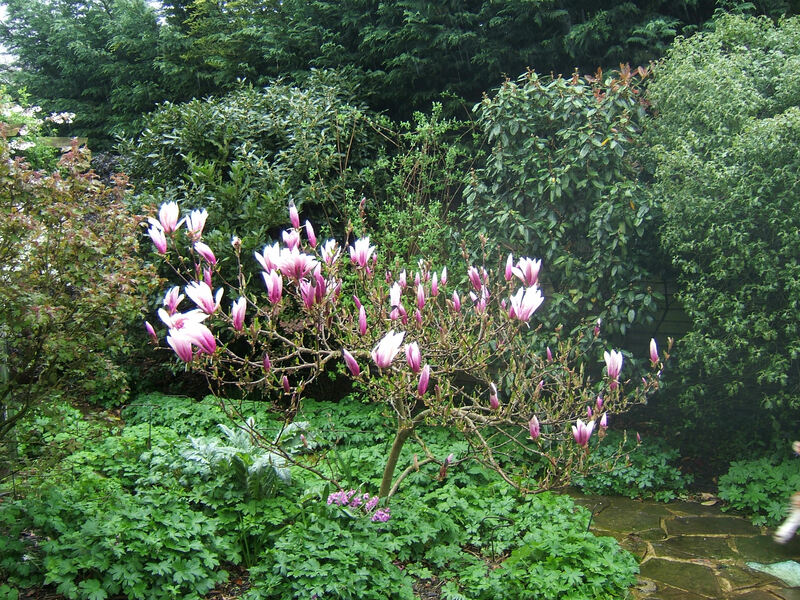 The Magnolia isn’t quite into full flower yet, but the Garden Introductory video taken almost exactly the same day a year ago showed absolutely no sign of flower then, and just look at it now. In fact the whole garden is so much further ahead than it was when I made that video. The interesting thing will be what is in flower when we open under the NGS in early June. Luckily the garden is designed to have a succession of plants in flower rather than peaking at one particular moment, so there is bound to be loads looking really wonderful when the weekend arrives. I had a lovely day out today. I went to one of my favourite nurseries with three dog owning friends and then afterwards, a pub lunch. It was a beautiful day, blue skies, fluffy clouds and warmth in the sunshine. What more could one ask? 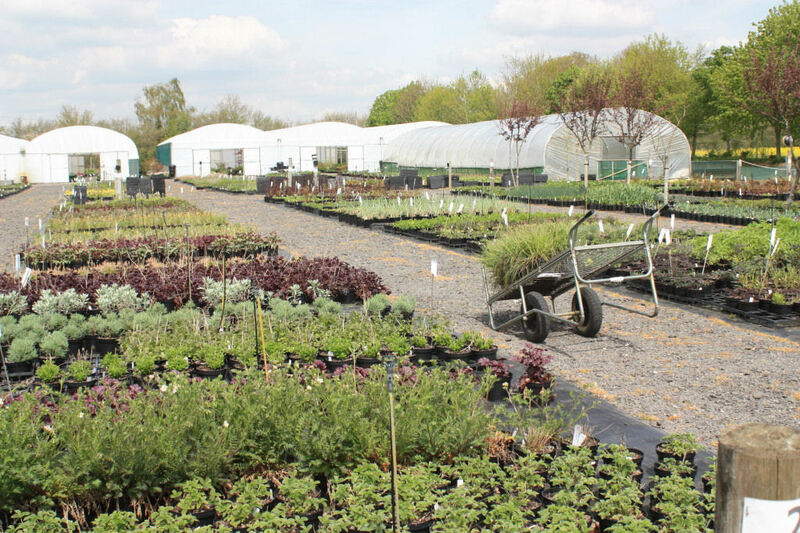 Hardy’s specialises in hardy perennials – my favourite group of plants. Unlike many places, they actually propogate a large proportion of their stock. A large part of the nursery was seperated off as they prepare for the Chelsea Flower Show, hopefully they will once again get a gold medal this year. Despite having less space to display the saleable stock, we still managed to spend two hours there, going up and down the rows seeing what took our fancy – and of course talking. It is amazing the memories that plants can invoke and the thoughts that they can bring. Given that we all have dogs in common as well, our conversation was very wide ranging. 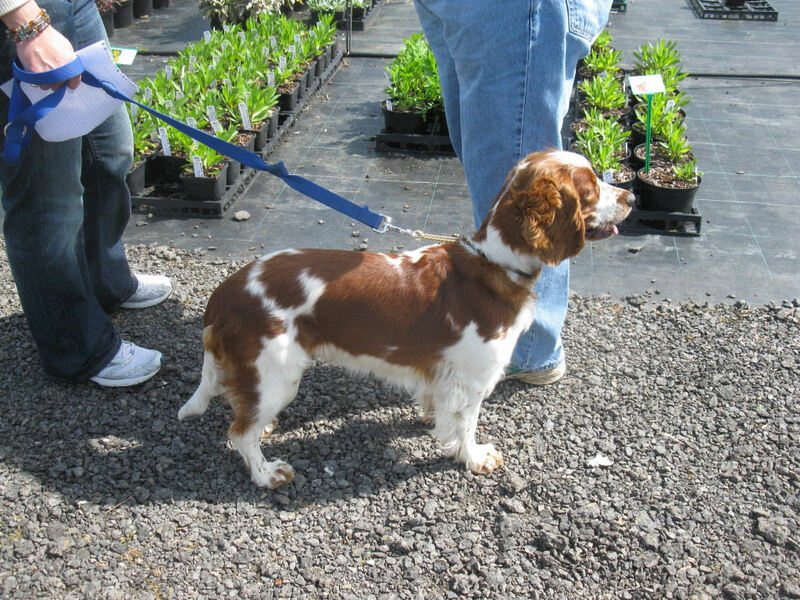 I usually tend to leave my dogs behind when I go plant buying – I need their space in the car to bring home my booty, but one of our number brought her dog with her. The nursery was happy for her to be with us and she was in her element with a number of other customers (and nursery staff) coming up to say hello. One of the benefits of my cottage gardening style (and my small garden) is that you don’t feel that you have follow the gardening text books and always plant in groups of three or five. I regularly buy just one of a plant, particularly when it is a plant that I haven’t tried before. This is not only reduces the demands on the purse, but also means that when I find a plant that is happy in my garden, I can get a variety of the family to increase interest. I was remarkably restrained in my purchases today, filling only half of my trolley. The fact is that I was all too well aware that despite the hard winter, the vast majority of my plants had survived and that I really don’t have a huge amount of space to fill these days. That said, I did manage to find some little beauties. All in all, it was a great day and we all enjoyed it so much that we are planning to make it an annual event. If you want to join us in North Hampshire in April 2011, let me know. 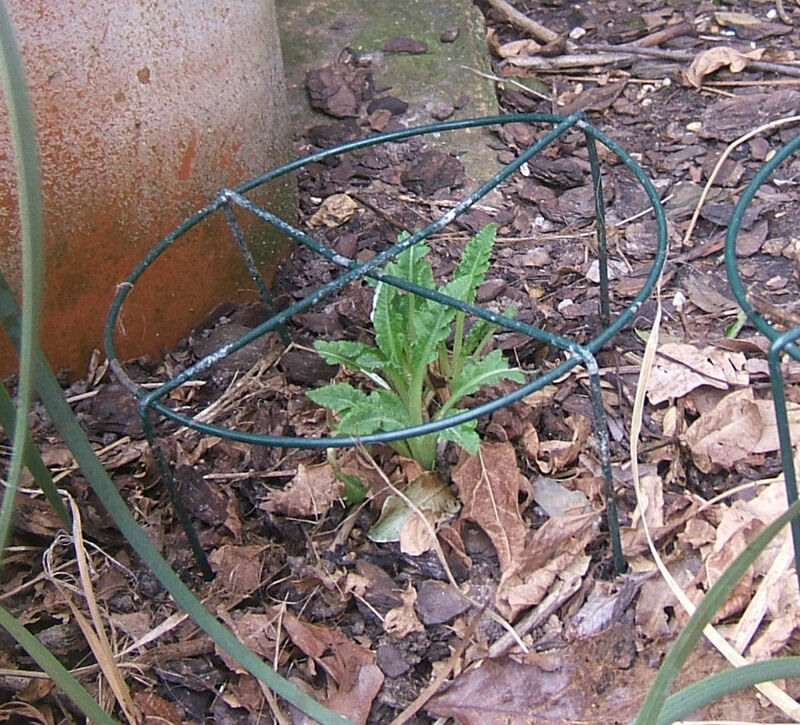 At this time of year, emerging perennials are at their most vulnerable to being trodden on, by humans and dogs alike. One way to avoid this is to use plant supports to provide a physical barrier for them. More information on this topic is available at Protecting the Garden from your Dog.